Since the Flood of 1927, the Mississippi river has been engineered and controlled, no longer depositing the large levels of rich sediment that feed the land over time. This modification along with the dire effects of industry has led our region to have one of the fastest eroding coastlines on Earth with more than an acre of land being lost every hour, about 25 to 35 square miles per year. Nearly 2,000 square miles have already vanished in less than a century. This loss of land, not only reduces acres of rich natural habitat for a vast tapestry of species, but also leaves New Orleans and many coastal developments vulnerable to storm surge and damage. In this piece I take viewers to the coastline, where the waters of the Mississippi river meet the Gulf of Mexico. Like a sprawling lily pad it sits atop a collage of coastal marsh, water and lines. 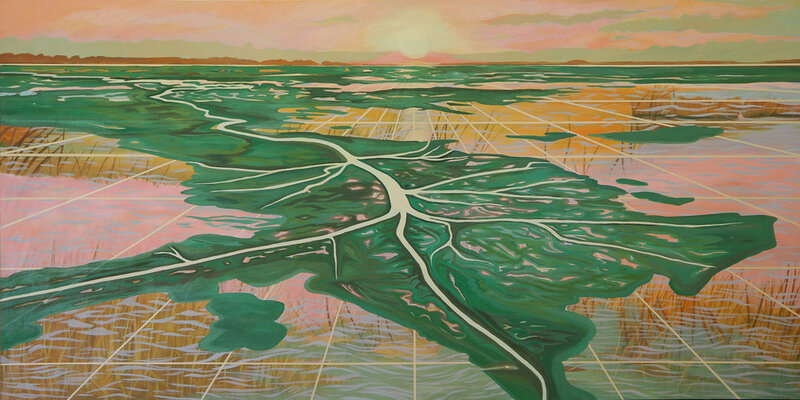 In my work, I collage painted layers of Louisiana ecology and topography to emulate and bring awareness to the natural and artificial processes of change in the region over time. The use of the perspective grids in my work draw the viewer’s eye, but also hint at the man-made canals that cut through our fragile wetlands by industry. By collaging together these native elements of Southern Louisiana I celebrate the beauty of living with these natural features and consider how our modifications to natural systems will portend for the region’s health in the long run. This mural takes the viewer to the coastline. The eastern facing wall depicts a sunrise with a fading line of cypress trees disappearing below the horizon. Obscuring this scene is the silhouettes of plant ecology from the surrounding Marigny neighborhood. The Mississippi sits atop where it curves and juts south to dump it’s waters in to the nearing Gulf of Mexico. By collaging together these elements of Southern Louisiana I admire the beauty of living alongside this ecology while also drawing the viewer to geography that has been undergoing significant change and will affect the health of New Orleans in the long run.